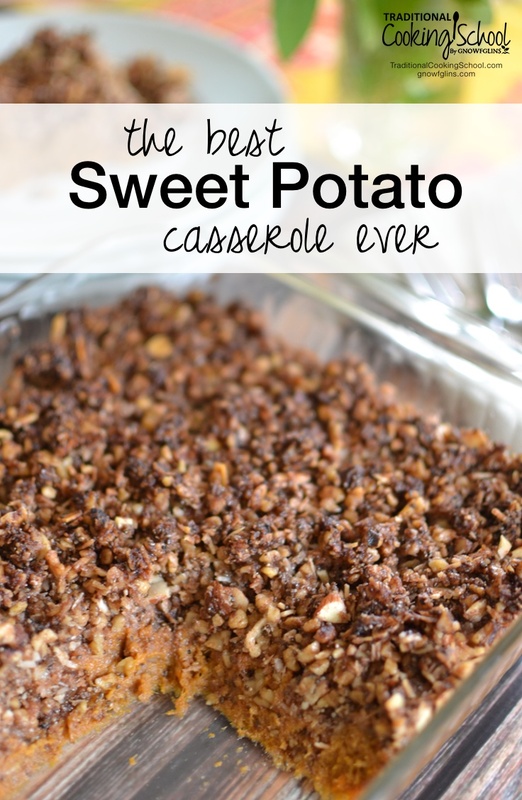 The Absolute Best Sweet Potato Casserole Ever! This sweet potato casserole hasn't won any awards, or a blue ribbon at the State Fair, or anything like that. 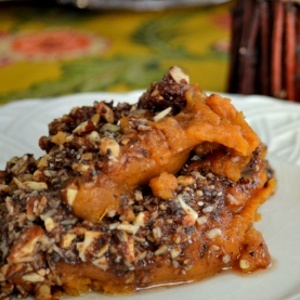 YET, I freely admit that I never liked sweet potatoes until I created this recipe. I make it for my family year-round, take it to cookouts and potlucks, and share it with many friends and family! It's so good! I love a couple things about it. 1. It doesn't have the traditional marshmallow topping. You can adapt it to just about every eating style out there! GAPS? Sure, use butternut squash (unless you're allowed sweet potatoes), ghee or coconut oil, and raw honey. Grain-free/gluten-free? Absolutely! This recipe doesn't call for a smidge of traditional flour, but uses coconut flour instead. Dairy-free? Yep. Substitute ghee or coconut oil for the butter in the crumble topping. Paleo? Depends on what version of “Paleo” you're following. Some say “yes” to sweet potatoes; others say “no”. Egg-free? Feel free to leave the eggs out completely or substitute a flax or chia egg. WAPF? Yes! Use soaked/dehydrated nuts in the topping, and you're good to go. Not following any particular eating style? Well, put this casserole on your holiday table this year, and I promise no one will ask you if it's health food. We have a friend who loves this casserole so much that he asks me to bring it every time we are invited to their home for supper — even in June! He eats it for dessert! I love a couple of things about this recipe. First, it doesn't have the traditional marshmallow topping. The second thing I love about this recipe is its versatility. You can adapt it to just about every eating style out there! GAPS? Grain-free/gluten-free? Dairy-free? Paleo? Egg-free? WAPF? Yep, yep, and yep! Cut the ends off the sweet potatoes, and prick each potato several times with a fork. Set on a parchment-lined cookie sheet, and bake until soft, 1 to 1-1/2 hours. Combine all topping ingredients in a medium mixing bowl. Using a pastry cutter, cut in the cold butter until the topping has the feel of wet sand. When the potatoes are soft, remove them from the oven and turn the oven temperature down to 375 degrees Fahrenheit. Carefully, remove the skins from the sweet potatoes. They will be VERY hot, but it is much easier to get the skins off when the potatoes are hot than when they are room temperature or cold. You can use a butter knife to help get the skins off more easily. Transfer the peeled potatoes to a large mixing bowl, such as the bowl of a stand mixer. If you don't have a stand mixer, you can use a hand mixer. Begin mashing the potatoes -- this is why I love my stand mixer! While the mixer is running, add the rest of the casserole ingredients -- the eggs, coconut milk, raw honey, coconut flour, salt, and spices. Spoon into a greased 2-quart baking dish. Cover with the crumble topping. *In this recipe, I like coconut palm sugar best. *If you want to serve it as a dessert, some homemade whipped cream or vanilla ice cream on top would be divine. *Consider this casserole for breakfast! It re-heats nicely in the oven. I can't think of anything better than to serve it with a side of crisp bacon! *Double or triple the recipe and freeze the extra to have throughout the holiday season. It never hurts to have extra food that is quick and easy to prepare for unexpected guests, a last-minute holiday party, or church gathering. Store the sweet potatoes in a gallon-size freezer bag or 2-quart Mason jar, and keep the crumble topping in a smaller bag or jar right beside it. Simply thaw, spoon into a dish, top, and bake! *Don't limit this casserole to November and December. Enjoy it throughout the months that sweet potatoes are in season. I'd love for you to prove me right on my claim that this is the best sweet potato casserole ever. If you make it, please let us know how much you loved it! If you have any questions regarding this recipe, I'm available in the comments below. Does your family enjoy sweet potatoes with your holiday meals? Does this sound like the best sweet potato casserole ever to you? Beautiful pictures, Lindsey! Thanks for sharing your recipe too. I intend to use your recipe for our thanksgiving meal with our sweet potatoes we recently harvested from the garden. I’m honored that my recipe will grace your Thanksgiving table! Please let us know how your family liked the sweet potatoes! I’m Totally trying this tonight w/ some of our home grown sweet potatoes. Looks yummy. I have sweet potatoes so I’m going to try it. I always dice and roast them so this will be a nice change. Doesn’t roasting the nuts destroy the enzymes though? willowsprite, I suppose cooking the nuts in the oven will affect the enzymes, but cooking with heat does that to just about everything with enzymes, right? Personally, I am not all that concerned with the enzymes in the nuts, as I love a great-tasting dish, enzymes or not. 😉 if you are very concerned about that, you could leave the crumble topping off until you’re ready to serve, so that it would be “raw” in a sense. I love the flavor and crunch added by baking the topping, but feel free to experiment with this however you like. Ok, I was just a little confused because I clicked on the link for crispy nuts and it said if you end up cooking them after doing all that soaking and dehydrating to unlock the enzymes, you lose them after all that work! Any chance you know how much sweet potato I should use if I’m using canned? Hi Kelly! Sorry, but I’ve never used canned sweet potatoes in this recipe. I bake and serve this out of a 2-qt. Corning Ware dish, and before the topping, the casserole fills it up about halfway. Maybe you can use that as your guide? my son is allergic to nuts but this recipe sounds and looks really good! Maybe I could subsitute the nuts with seeds instead? What kind of seeds do you think would be good to replace almonds and walnuts? I don’t typically have coconut milk on hand. Can raw milk or raw cream be used instead, and how much? This was absolutely delish! The flavors combined so well and I felt good about eating this. I used sucanat. I can’t see why I will ever try another recipe other than this one! Thank you! I was wondering why you took the skins off? We leave the skins on all our potatoes – both white and sweet – for added nutrition (not to mention easier for the cook) Just curious. Thanks for this recipe! Great question! Once the potatoes are baked and cooled slightly, the skins literally slip right off so it’s not much more effort for the cook. I peel the potatoes as a matter of preference; that’s it. 😉 If you want to include them, go for it! Thank you so much for that comment, Robert! You’ve made my day! I love to hear when someone loves one of my recipes and it becomes a family favorite!